In the early 1800s an iron railway was constructed between Consall Forge in the Churnet Valley and Weston Coyney. To understand why it was built we have to take a look at other developments driven by Britain`s Industrial Revolution. It created a need to move large quantities of materials and goods around the country. The potters of North Staffordshire were keen to see a canal that would link the River Mersey and the River Trent. With the backing of men like Josiah Wedgwood, the Duke of Bridgewater and Earl Gower, the Trent and Mersey Canal was opened in May 1777. The developing network of canals made it easier for the pottery towns to obtain raw materials and to send finished goods to other parts of the of the country. The Trent and Mersey Canal Company also built tram roads linking the pottery towns of Longton, Hanley and Stoke with the canal. In 1778 the company opened the Caldon branch of the canal to transport limestone which had been quarried at Caldon Low. Initially the branch ran from Froghall in the Churnet Valley to Etruria in the centre of the Potteries. Although the Caldon branch provided a vastly superior method of transport in comparison to the roads it was not a perfect solution. The quarry owners complained that the canal was often frozen in winter and the water levels were too low in the summer months. In 1815 a group of local landowners formed a partnership to provide an alternative route to transport the limestone avoiding all but a small section of the Caldon branch. A horse-drawn railway was to be constructed from the canal wharf at Consall Forge to the pottery town of Lane End (Longton). The railway is remembered as the Consall Plateway and as Peter Lead reveals in his book `The Caldon Canal and Tramroads` the enterprise was the work of the first North Stafford Railway Company. It seems that the partners of the railway company were hoping that the Trent and Mersey Canal company would extend their tram road at Lane End (Longton) to a point near to Cinderhill. As the plateway would also terminate near to Cinderhill this would create a rail link between the wharf at Consall Forge, the Potteries and with the Trent and Mersey Canal. This would also create an opportunity for the sale of limestone and calcined lime along the route of the plateway. 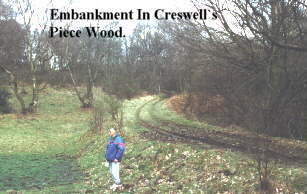 The work progressed quickly and by 1817 the section between Consall Forge and Creswell`s Piece Wood had been completed. The partners applied to the Government for a loan to complete the scheme in July. At that time the partners were listed as ; Sir Thomas Hugh Clifford, Baronet, of Tixall; John Leigh of Consall Hall; Walter Hill Coyney of Weston Coyney; Walter Weston Coyney of Weston Coyney and George Lambert Clifford of Foxearth House. passed behind Consall Old Hall and through the Blackbank Plantation. A tunnel was constructed to take the line underneath the road that runs from Wetley Rocks to Cheadle. The plateway crossed the present day A52 at Lime Wharf Bank, continued past Moorville Hall and entered the wood at Creswell`s Piece. Leaving the wood the route continued towards the cross-roads at Weston Coyney crossing the Leek Road near to the location of the former Blythe Spirit public house. The plateway then crossed Park Hall Road to reach a wharf at Lime Farm. The Weston Coyney Arms public house marks the approximate position of the former Lime Farm. The plateway did not have a long life, part of the line was abandoned by the mid 1830s and it is thought that the whole line was abandoned within the following 10 years. Although the intention was to connect the plateway to the tramway owned by the Trent and Mersey Canal Company the evidence suggests that this did not take place. This drawing shows what the plateway may have looked like. Actually it is a drawing depicting a section of Fayle`s Middlebere Plateway in Dorset and it is reproduced here with the kind permission of Chris Legg who owns the copywrite. 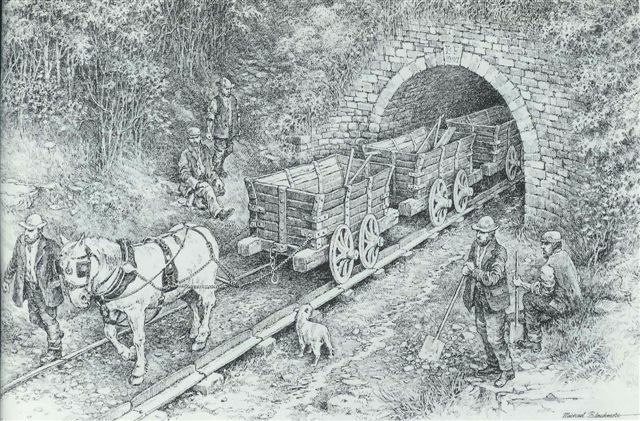 It could almost be a view of the Consall Plateway as the wagons emerge from the tunnel under the road. There is a historical link between the Middlebere Plateway and North Staffordshire, it was built to take Ball Clay from the clay pits near Corfe Castle to Poole Harbour. Josiah Wedgwood purchased large quantities of this ball clay to manufacture his famous wares. The design of the Consall and the Middlebere plateways was typical of the time. In those early days the plates (rails) had an L shaped cross-section. The plates were laid with the open side of the L section facing outwards. This arrangement prevented the wagon wheels from running off the track. The drawing shows the arrangement clearly. Within the next few years engineers would begin to adopt the design that we see in use today where the rails have an open running surface and it is the wheels that have a retaining flange. A few traces of the plateway can still be found today. The route of the track can be seen in places at Consall Forge together with some of the sleepers. They are easily recognised by the single hole where the metal spike was driven. 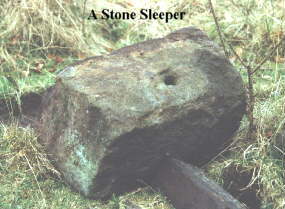 This is a photograph of a stone sleeper which was found near to Creswell`s Piece Wood, the hole for the metal spike can be seen clearly. The tunnel under the Wetley Rocks / Cheadle road is still there but the entrances are closed off. The route can also be seen in Creswell`s Piece Wood marked by the path leading from Sheepwash towards the north. If you would like to know more about Benjamin Fayle and his Middlebere Plateway please send an e-mail to the mailbox. I will pass your enquiry on to Chris Legg.